Speche’s eScription technology is integrated as a web-based service designed to facilitate the delivery of real-time streaming text to anyone, anywhere. Taking real-time input from a captioner or shorthand reporter, eScription converts the data stream into an Internet friendly format and distributes it instantly to the targeted viewers. The converted data stream is so small that Internet connection speeds are not relevant. The text is delivered instantly whether you are using high-speed access or a dial-up modem. The real-time text stream is displayed in a text box that enables the viewer to customize the font type, size, and color as well as the background color. This insures maximum viewing pleasure and comfort. The text box, with permission from the distributing organization, will even provide a searchable transcript feature that will show and save all text received since entering the event. Please see the diagram for an illustration of how the entire process works. You can click on any of the individual components of the process for more specific details. If you’re a captioner or real-time reporter on a Windows based CAT or Captioning system, chances are you already have just about everything you need to get started. 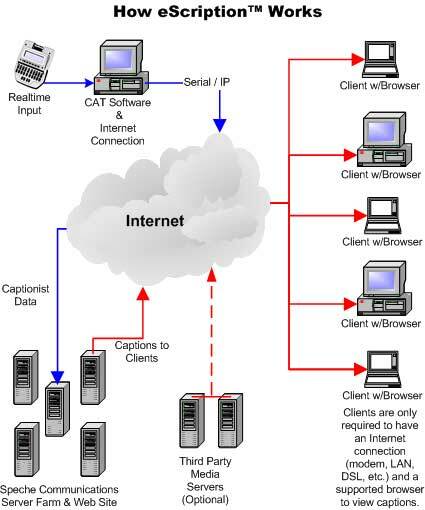 Currently, you are directing your real-time feed to a com port where it is being distributed to another computer or perhaps a modem. In our process, we use a little piece of software to redirect that same signal (CaseView, Line 21 or ASCII) to an IP address (Internet location) where Speche then performs its magic (more on that in another section). All you’ll need in addition to your translation system is an Internet connection, a phone line if you are working remotely, and the COM Port redirection software (Please contact us for available options). It’s really that easy! Whether it’s internet depositions, webcasting, or remote CART that interests you, you’ll be ready to go in no time with Speche Communications. Speche's unparalleled ability to deliver streaming real-time text over the internet is the result of an advanced technology platform that, unfortunately, is far too extensive to explain here. But in a nutshell, our technology receives the real-time feed from the reporter/captioner, matches it to a pre-scheduled event, parses the text for conversion to an Internet friendly format and then readies it for delivery to any number of viewers via our SpecheBox™ technology. Currently, our technology lends itself to three forms of Internet captioning; Court Reporting, Webcasting, and CART . Our Court Reporting (remote viewing of legal depositions and proceedings) solution provides a simple yet powerful means to deliver real-time testimony to remote participants in a traditional legal transcript format. With Webcasting, our technology works hand in hand with other media streaming services and synchs the text to any associated audio and video media. The end viewer therefore receives one packet of information. With CART (Communication Access Realtime Translation), the Speche platform bonds the real-time writer with the viewer, providing not only streaming real-time text but also a personal "chat" feature that provides two-way communications between the participants. In all cases, the entire process can be facilitated in a fraction of a second. Best of all, there is no complicated software to learn on either end of the process. Perhaps the most visible component of our technology is our SpecheBox, a Java applet that instantly appears on each viewer's browser to facilitate the viewing of the streaming text. What appears as such a simple and clean text box is actually a programming marvel. First, it's important to recognize that in today's business world, Internet security is the uppermost IT priority. Firewalls are getting evermore restricting and one's ability to access data from outside these firewalls is growing more and more difficult. While some competing companies promote a streaming text capability, they accomplish it by delivering a proprietary text format that requires opening ports on the firewall in order to complete the delivery. Can you imagine wanting to broadcast an event and asking all the intended recipients to go to their network administrator and request that one or more firewall ports be opened? It won't happen. Fortunately, with Speche, it doesn't have to. Speche receives a proprietary signal from the realtime reporter/captioner and reformats that signal to an Internet friendly format for delivery over HTTP or HTTPS. The text passes freely through the firewall on Port 80 or 443 (the standard Internet ports). That means anybody, anywhere can view the text. In addition, unlike competitive offerings where the broadcaster determines a set format that cannot be altered, we use our aforementioned Internet friendly text format to allow viewers to adjust their display to their liking. Font type, size and color can all be adjusted along with the display's background color. We even provide a "Review Transcript" capability at the broadcaster's option that allows saving, searching, and printing of the entire transcript. It's simple. It's flexible. It's affordable. It's easy to get started. It's Speche Communications. Live synchronized captions can be added to any web based media presentation. We have simple and easy to follow instructions for placing the SpecheBox on any web page. You can download the installation document at any time. The initial installation will connect with our continuously running demonstration, so you can test at your convenience.